I bet lots of people have New Year’s Resolutions to eat more healthy foods, like fruit. Let me tell you that it would be so much easier to eat fruit if it always came in cupcake form! These cupcakes, though they don’t look all puffy and perfect (likely due to my choice to use baking powder instead of baking soda… oops! ), they are packed with all the right flavors. The key is the pairing of the mellow sweetness of banana and the rich, chocolatey punch of the fudge-like frosting. 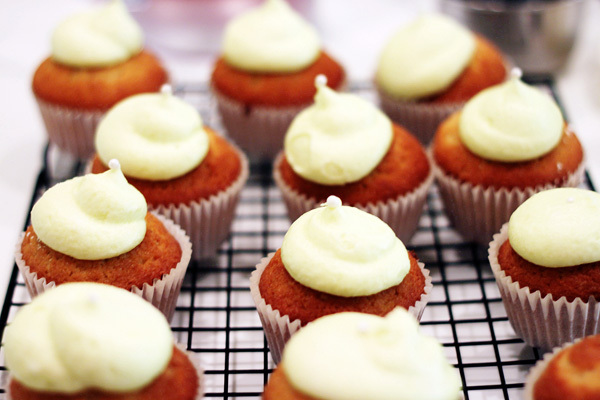 Sometimes we just need a reliable cupcake recipe. One that just works, without fussing and worrying. 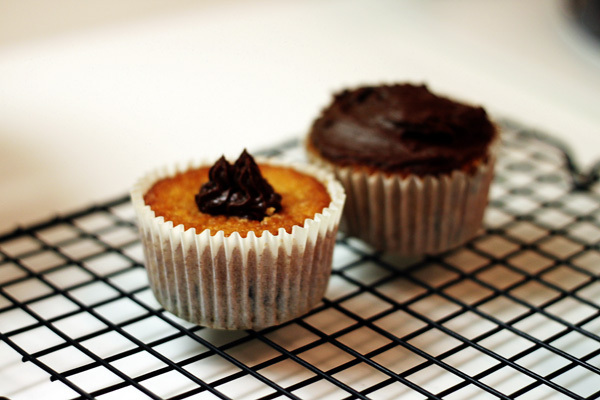 I’m thinking that this recipe from Crazy about Cupcakes just might be the go-to cupcake recipe for me. 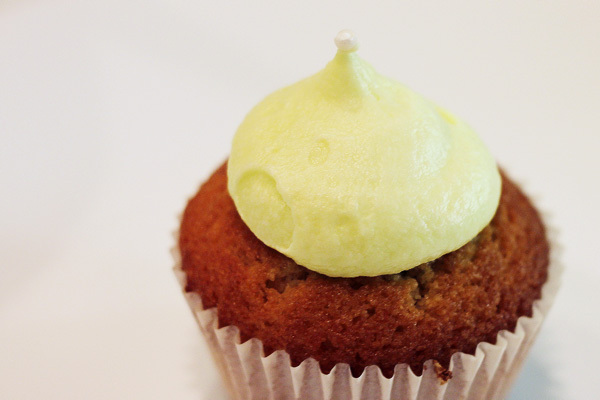 She calls them golden cupcakes, but taste just like good, traditional yellow cake cupcakes. They are deserving of their elevated name though, because they just puff up so nicely and uniformly and are a breeze to make. These cupcakes taste a bit like lemonade and birthday cake, totally inappropriate considering this season of spicy, festive flavors. But sometimes you just want a private little celebration in the kitchen, without involving Santa and the Christmas sprinkles. And that’s okay! The final look of a cupcake is just as important as the taste. This much is obvious. Why else would Cupcake Wars have an entire round dedicated to presentation? (And yes, Cupcake Wars is law.) I’ve bought many a star tip to achieve that beautiful swirled look, and unfortunately, I am not all that adept at wielding an offset spatula. But I’ve always liked that puffy, bulbous, St. Basil’s Cathedral at Russia-type frosting too. One day, I had an epiphany. I could decorate cupcakes with a plastic bottle. And it would look amazing. Coffee is one of those flavors that translates well into various baked goods. Cupcakes are no exception. This recipe is from Krystina Castella’s book Crazy About Cupcakes that my boyfriend got me as a part of our 2-year anniversary celebration. While the photography is a little lacking in her book, it has countless recipes that I can’t wait to try. 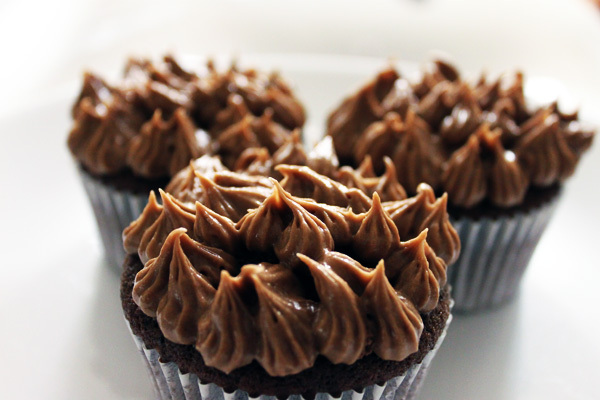 I haven’t made anything coffee flavored yet, so I thought her recipe for mocha cupcakes would be a good place to start. Per her recommendation (and admittedly a safe flavor combination), I paired the mocha cake with mocha frosting. The flavor is dense and very coffee-y, so people that like their coffee on the milky side, this may not be for you.